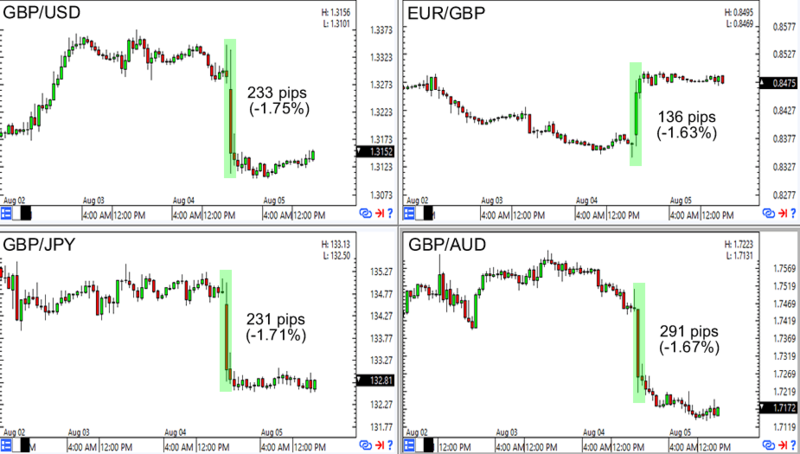 Heads up, pound traders! The U.K. economic calendar is filled to the brim with top-tier catalysts this week so I’ve rounded up the expectations for these events and how sterling might react. 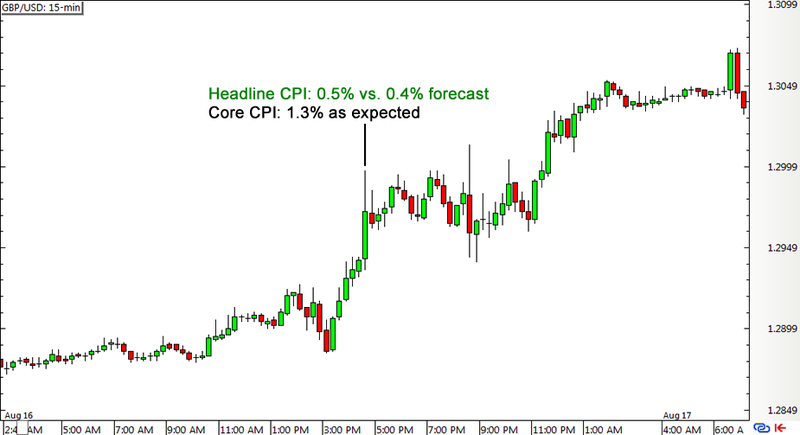 Another uptick in price levels is expected for August, as the headline CPI is projected to climb from 0.6% to 0.7% while the core CPI is slated to rise from 1.3% to 1.4%. If so, this would mark the third consecutive monthly gain in headline inflation, partly supported by the pound’s depreciation last month. In the previous release, the headline figure beat expectations with a 0.5% increase versus the 0.4% consensus while the core reading came in line with estimates at 1.3%. Still, Cable had a pretty stellar rally that started nearly an hour before the actual numbers were printed, as traders thought that strong post-Brexit inflation data could discourage the BOE from adding stimulus. The U.K. jobs release can be tricky to play since this has three main components: the claimant count, the average earnings index, and the unemployment rate. An increase of 1.7K in the number of claimants is expected for August, signaling a drop in hiring for the month, while the average earnings index for the three-month period ending in July could slide from 2.4% to 2.1%. The unemployment rate is expected to hold steady at 4.9%. 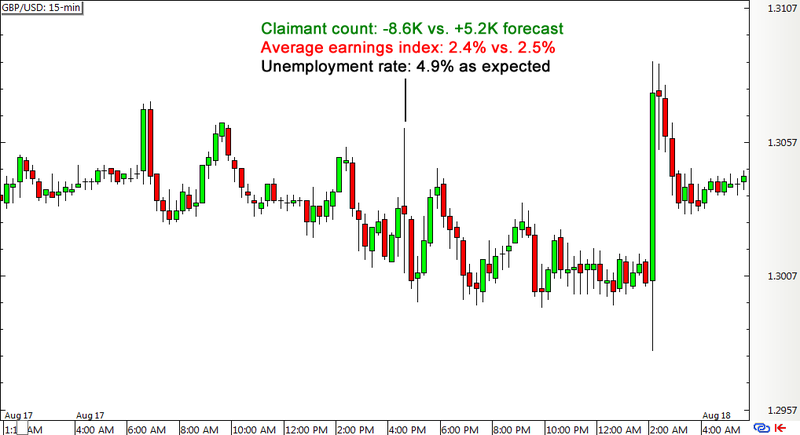 During the previous release, the actual results came in mixed as the claimant count printed a surprise drop in unemployment while wage growth turned out weaker than expected. Cable trudged lower for the remainder of the London session only to pop up when the FOMC minutes were printed later in the day. After printing a stellar 1.4% gain in July, U.K. retail sales are expected to be 0.4% lower in August, although some expect that the weak value of the pound still kept domestic consumer spending afloat last month. As you can see from the chart below, GBP/USD had a strong bullish reaction to the upside surprise, especially since most market watchers had been expecting to see a meager 0.1% uptick in retail sales after the EU referendum. 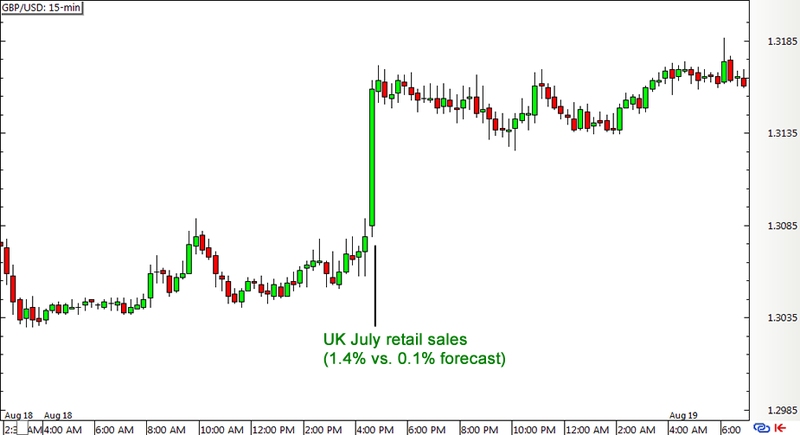 This time around, however, the pound’s reaction to the U.K. retail sales report might be muted since the report will be printed just a few hours before the highly-anticipated BOE statement. It seems as though the U.K. economy is saving the best for last since the BOE statement and meeting minutes could yield the biggest reaction among these top-tier events. In their previous central bank decision, pound pairs moved by hundreds of pips after policymakers announced a rate cut, launched the term funding scheme, purchased corporate bonds, and restarted the asset-purchase program. Whew! But since they’ve already eased in August, BOE policymakers might decide to sit on their hands this month and opt to wait for their recent stimulus efforts to work their magic instead. Then again, its August statement hinted that there’s scope for further action and BOE Governor Carney’s tone during the Inflation Report hearings last week confirmed that the U.K. central bank is just warming up. Another batch of easing measures or clues suggesting that the BOE could pump up stimulus in the coming months could trigger a sharp selloff for the pound, but a decision to hold their fire could spur a similar reaction to the euro’s post-ECB rally. In any case, be on the lookout for Brexit-related remarks from policymakers since these could determine their monetary policy road map for the rest of the year. As always, allow me to remind y’all that there ain’t no shame in sitting on the sidelines and watching the forex fireworks if you think you might get burned from all the additional volatility. If you’re planning on grabbing pips from these events, don’t be shy to share your game plan in our comments section below!